Coming up I-5, take Highway 36 East in Red Bluff 14 miles to Manton Rd. (CR A-6). Turn Left on Manton Rd (sign says to Manton) and go about 14 miles. Turn right at the Manton store onto Forward Rd. and go 3.8 miles. Then take a left onto Ponderosa Way. We are on the right at 21770 Ponderosa Way. Coming down I-5, take Highway 44 East in Redding to Shingletown. Turn right at the library at Wilson Hill Rd. Follow the signs to Manton (about 8.1 miles). Go straight onto Forward Rd. about 3.8 miles. Then take a left onto Ponderosa Way. We are on the right at 21770 Ponderosa Way. Take Highway 99 north 38 miles to Highway 36. Go east on 36 11.3 miles to Manton Rd. (CR A-6). Turn Left and go about 14 miles. Turn right at the Manton store onto Forward Rd. and go 3.8 miles. Then take a left onto Ponderosa Way. We are on the right at 21770 Ponderosa Way. NOTE: Mapquest, Google Maps, etc. are incorrect regarding the final LEFT turn onto Ponderosa Way. Please check our website for directions to the monastery. The Monastery of St John of San Francisco was founded in 1996 in Point Reyes Station, Marin County, California, in the Diocese of the West of the Orthodox Church in America, under Bishop Tikhon of San Francisco. The initial location of the Monastery was at St Eugene’s Hermitage, which had been established by Archimandrite Dimitry (Egoroff) in the early 1950’s. The Point Reyes property was in deep forest, on the ridge between the San Andreas Rift Valley with Tomales Bay, and the Pacific Ocean. Fr. Dimitry built two small cottages on the property, one with a chapel in the traditional Athonite monastic form of a “kellion,” for one monk; and a second building for guests, with a kitchen and reception area. The elder lived there as a hesychast for almost twenty years. His holy prayers permeate the place. 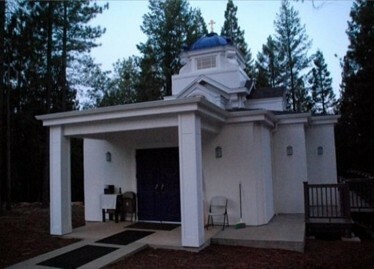 In 1988, a beautiful but tiny church was built on the property. Due to local politics, it has been virtually impossible to expand the facilities there. There were several interim occupants after Fr. Dimitry. In 1983 Abbess Barbara and her nuns from Calistoga took refuge there, and remained until they could no longer care for the property. The Brotherhood of St John’s Monastery was established to provide a monastery for men in the Diocese of the West at the end of October 1996, and continued there until it completely outgrew the facilities, acquiring a retreat house in Manton in July 2006. The new facility was built in 1999 as a healing retreat, with 18 bedrooms and 12,000 square feet; plus a 4-bedroom guesthouse and freestanding workshop/garage, on 42 acres. It has all the space necessary for our community to grow and prosper, both in terms of living space as well as work space, and appropriate room for hospitality. Very little modification was necessary to make the building immediately usable, albeit with a temporary chapel and kitchen-dining facilities. Tehama County was very helpful in expediting the Use Permit. The property was purchased at the end of June, 2006, and we began to move in immediately. Through the generosity of our friends, we were able to raise $500,000 in cash for the downpayment. This leaves $750,000 in a mortgage yet to be paid off. The first service was held on our Patronal Feast of St John of San Francisco, with the Vigil on July 1, and the Liturgy the following day. We have since had our regular cycle of services, daily matins and vespers, and the Divine Liturgy several times per week. On the Feast of the Protection of the Mother of God, October 1/14, 2006, His Grace Bishop Benjamin tonsured two brothers, one to the Small Schema, the other as Rasophore. With the sacrament of Monastic Profession, and the vows of poverty, chastity, obedience and stability, our new home has already been fulfilled as a monastery by the grace of that Mystery. We currently have 8 full-time members in our community, including two priests; others come from time to time to discern God’s will for their lives. We come from many different backgrounds, both in religion and in education. Most of us are converts to the faith. We also represent whole spectrum of Orthodox communities in America: the OCA, Greek Archdiocese, Antiochian Archdiocese, and the Russian Church Abroad. This pan-jurisdictional character of our Brotherhood reflects our vision to be a point of unity for all Orthodox Christians. Our vision as a monastic brotherhood is to incarnate the Gospel in our lives through our work and prayer and love for one another. We strive to be faithful to holy tradition while adapting to the realities of contemporary America. The aim of our life is simple obedience to the commands of Christ in the Scriptures. We earn our living by candle-making, publishing, and operating a bookstore, and we also grow some of our own food. As God works in us His miracle of salvation, our hope is that our light will so shine forth that others may see our good works and glorify God in heaven.